In homage to Paul Ford. Todays comment, in 6 words: This is awesome pattern envelope captioning! such lovely dresses…they must be the cutest little gangbangers I have ever seen. So pretty! (And hilarious.) Do you happen to know the pattern number? What have these girls been up to? Yellow looks like shes about to be madly sick. My first impression was that the girls were reacting to an incidence of flatulence. Evidence, perhaps, that I am overdue for some adult conversation (my son has recently discovered potty humor – how long does this stage last?). Yellow dress: Ewwwwww!!! What is it??!! !White dress: Yuck! It stinks!Grey dress: Im not even going to look at it! Amen to Hannatus comment. Cute dress, hilarious illustration. Oh, the diamond one! The diamond one! Did they actually MAKE that fabric with the border print? Even the strangest hand signals cant spoil that spectacular print! Perfect. You are over the top–again! LOL! My first thought before scrolling down was Talk to the hand! Dont be caught with undainty B.O. Also with Natalie. Yellow either did it or is looking at the offending source.My youngest boy (of 3) is 16. I think they all outgrew it a long time ago, but I didnt. ROFL!I really, really wish that pattern were mine. Natalie – all their lives. 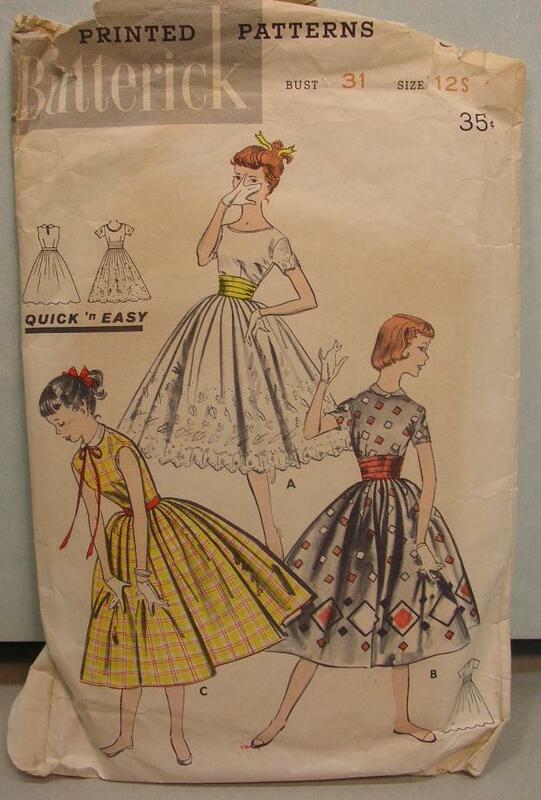 I noticed the phrase quick and easy are they referring to the girls or the pattern. Makes me think of the White chicks and Gang Signs photo project a friend of mine did a few years ago. Hed go to bars on the weekend and get white chicks to flash gang signs, made a huge composite of it. Great stuff. Im thrilled to see this, odd hand gestures or not. A is my 8th grade graduation dress, which I loved! Mom made it in white organdy eyelet with a pale blue polished cotton cumberbund. Although this pattern cover looks vaguely familiar, and view A is definitely the same as my dress, Im not sure this is the pattern she used. She never cared for Butterick patterns though I dont remember why. I love that your mom made you cute, special dresses, Daisy, that you still remember with happiness!